No school for students/workday for teachers. Warm up:How does sound usually travel? Look back at your ahah page if you need to. Learning Target: I will explain how the ear works. Read the How Sound Works E book with your partner create a KWL as you read this short booklet. Complete any uncompleted assignments for the week. All missing/late work must be turned in by Monday. Warm up:How is conductive hearing loss different from sensorineural? Warm up: What factors affect the speed of sound? Learning Target: I can describe the interactions of sound waves. Today we will learn about echolocation, reflection, constructive, destructive wave, interference and resonance. 1. On an oscilloscope, does a wave with a larger amplitude (greater crests and troughs) indicate louder sound or higher pitch? 2. As frequency increases, does pitch get higher or lower? 3. What is the speed of sound dependent on? 4. What do you think happens when two sound waves interact with each other? 1. What are the following: echo, interference, sonic boom, standing wave, resonance, reflection, constructive interference and destructive interference. 2.Explain echos using a location in school. 3. Why is it hard to hear in the gym sometimes? Learning Target: I can explain what vocal cords are and how they produce sound. Tina Marie Diamantini of the Yale-New Haven Teachers Institute says that humans produce sound in the following way, "The human voice is produced in the larynx, which is a part of the throat. There are two small pieces of tissue that stretch across the larynx with a small opening between them, these tissues are our vocal cords. As we speak, muscles in our larynx tighten the vocal cords making this small opening become narrower. When air from our lungs passes through the tightened cords a vibration is produced. This vibration produces vocal sounds. The tighter the vocal cords, the more rapidly the vocal cords vibrate and the higher the sounds that are produced. This is what causes the human voices to have different pitches.6"
What have you learned today?Create a story that you can share with a younger person telling him/her about how we produce sound using our vocal cords. Warm up:What are vocal cords and how do they function? Learning Target: I can explain what sound is and how it effects me. Today you will visit 5 different stations. Complete the questions at each station and create a study guide for your test on Tuesday, January 26th. Students will go straight to lunch after HPEX. They need to take lunch box, money, etc with them to HPEX. They need to be reminded that they are still expected to go to their assigned lunch line and table. We will place laptops on overflow tables and stairs. Complete stations your test is on Thursday, January 28. Go back into schoolnet and review your test to see what you missed. When you finish you test please read the booklet(The Conservation Crew...). These people will be at our school next Wednesday. Complete a 3,2,1 on the booklet. Warm up: How is a boiled egg and the Earth similar? Learning Target:I can summarize the structure of the Earth based on relative position, composition and density. Which layer is the largest, how do you know? Which layer is the only totally liquid layer? What cause the Earth's magnetic field that surrounds the Earth? Have scientist drilled to the center of the Earth and if they have how far would they have to drill? Ticket out: Sum it up. Warm up: How do scientist use waves to determine the composition of the Earth? What is the relationship between seismic waves and the Earth's layer? How are the layers similar and how do they differ from one another? ​Power point use the 12 layers and handouts/guide notes to record what you learn about the Earth's structure. 2:30-2:45 Switch classes, homeroom, etc. Warm up: Pair share your concept map with your seat buddy- Record something that you learned from your buddy. Learning Target:I will label or illustrate a model of the layers of the Earth. Ticket out-Write a one sentence summary that explains what you have learned today. Warm up:Finish your foldable and place it in your interactive notebook. Read the section How Has Earth's Surface Changed Over Time? On pages 4 and 5 of the Earth Processes booklet. Ticket out: How does the interaction of plates cause the Earth's crust to change? 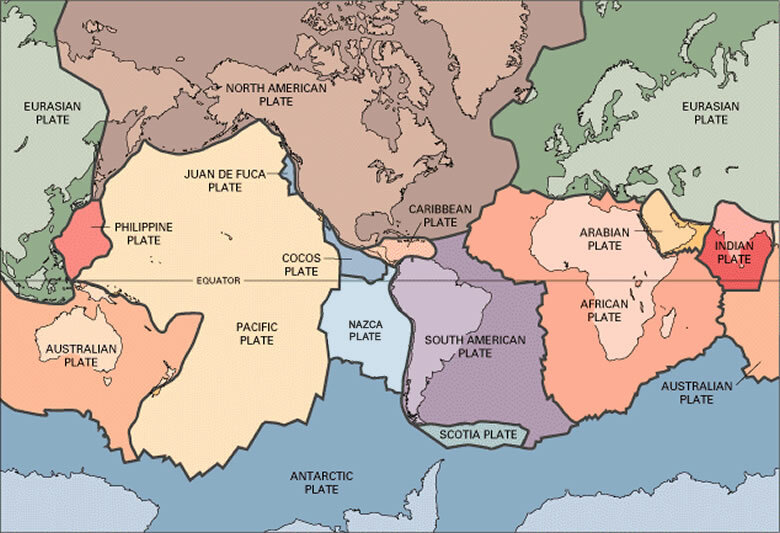 Warm up:In 25 words explain the theory of plate tectonics. You can look on pages 108-109 in the text. Ticket out: 3, 2, 1- Three things you learned, two facts that were confirmed, and one question that you have. Warm up:Ed Helper What Causes Plate to Move? How Has Earth's Surface Changed Over Time? Read pages 4-5 in the booklet Earth Processes. Let's create Pangaea- place this activity into your interactive science notebook. List/explain the evidence that supports the theory of Pangaea. Warm up: What is the theory of continental drift? What is the evidence that supports the theory? Create a concept map to compare and contrast the boundaries. Warm up: What occurs at each of the three plate boundaries? Make a chart to answer the question. Learning Target: I explain how crustal plates move and interact to cause earthquakes. Ticket out: What is the most important thing that you have learned today? Warm up: How is a normal fault a reverse fault and a strike slip similar and different? Warm up: Show me what you know, you are a journalist for a magazine called "The Falcon Science World". Your task is to write an article that explain what an earthquake is, why they occur, and how there magnitude can be measured. Learning Target:I can explain how crustal plates and ocean basins move and interact using volcanoes to reflect forces within the earth. Warm up:How are volcanoes classified? Ticket out: Write a one sentence summary about volcanoes. Learning Target: I will compare and contrast major volcanic eruption. Review what makes volcanoes erupt differently? Create a chart that compare and contrast volcanic eruptions. 2. What are the types of volcanic eruptions? 3. What types of hazards are associated with volcanoes? 4. Fact that you have learned this week about volcanoes. 5. Name an example of each volcano type and give it's location. Warm up: Create a triple T chart to compare and contrast the different types of volcanoes using at least five facts per type of volcano. Learning Target: I can explain why Earth constantly changes and how these changes affect us. Complete the posters that you started on Friday, February 26th. a. Illustrate a model of the layers of the earth. c. Compare and contrast the composition and density of each layer. Don't forget to site your sources and to save. Ticket out: Pair share and Check. Share your project with you seat buddy. Make corrections and save, save, save. Warm up: How do we know that the earth is composed of? Ticket out: Self check: Did you save? Look at the list above did you address each one? Warm up: Share your power point with the person closest to you, make corrections and save changes. Learning Target: I can explain how crustal plate and ocean plates move and interact using heat flow to reflect forces within the earth. Today you will continue your project that explains why Earth is constantly changing and how it affect us. Remember what we have study about, use your interactive notebook, the text, handouts, web sites that we have used and other resources that I approve. Today you need to answer/address this question in your project. convection currents within the mantle, lithosphere, asthenosphere, stress on plates, earthquakes, faults, and volcanoes. Make sure you explain and illustrate each. Don't forget to save. What is the relationship between the movement of tectonic plates and convection currents? Where is the lithosphere, and what happens there? Where is the asthenosphere, and what is it like? Why do earthquakes occur with regard to the convection currents that occurs inside the earth? Why do volcanoes occur with regard to the convection currents that occur inside the earth? Warm up: Recheck your power point. Look back at Monday- Wednesday's assignments/agenda. Have you completed all of the task, answers all of the questions? What causes earthquakes and how are they measured? Don't forget to site your sources, save and have pictures. Warm up: Recheck your power point and email it to me if you haven't. Warm up:Students that have not presented their power point will do so now. ​Today you will visit five stations. You need to answer each question at the stations. We will go over the answers at the end of the class period. Complete stations and review for test. Warm up: Go to Power School check your science grades and assignments. Introduction to the Rock Cycle from Brain Pop. 1. What are the three types of rocks that make up the rock cycle? 2. How do igneous rock form? 3. List four examples of igneous rock. 4. What type of rocks form on the earth's surface due to erosion? 5. List five examples of sedimentary rock. 6. How do metamorphic rocks form? 7. List four examples of metamorphic rock. 8. Why is the rock cycle called a cycle? 9. Draw the rock cycle and explain what happens during the steps. Worksheet to help you with the story you are going to create. ​It is your time to create a story about Roger, a metamorphic rock. You must describe at least three transitions that Roger goes through during his life, such as changing from metamorphic to igneous, igneous to sedimentary, and sedimentary to igneous. You have the option of writing a diary, creating a cartoon, or making a children's book. This project will be due next Friday, March 18th.